It's time for weekly space-links of astronomy and planetary science stories that we didn't cover on Space this week. The fluid dynamics of a supernova type II core collapse is gorgeous. Anniversary of the first test flight for the Avro Arrow, Canada's big hope and crushing disappointment for a jet interceptor. A neat writeup on an aspect of the history of geometry and fractals. Binary star systems might have better odds of habitable moons. XKCD looked at dropping tungsten countertops into the sun. 50th anniversary of the 1964 Great Alaska earthquake and tsunami. Interview about passing the time while minding telescopes in Antarctica. 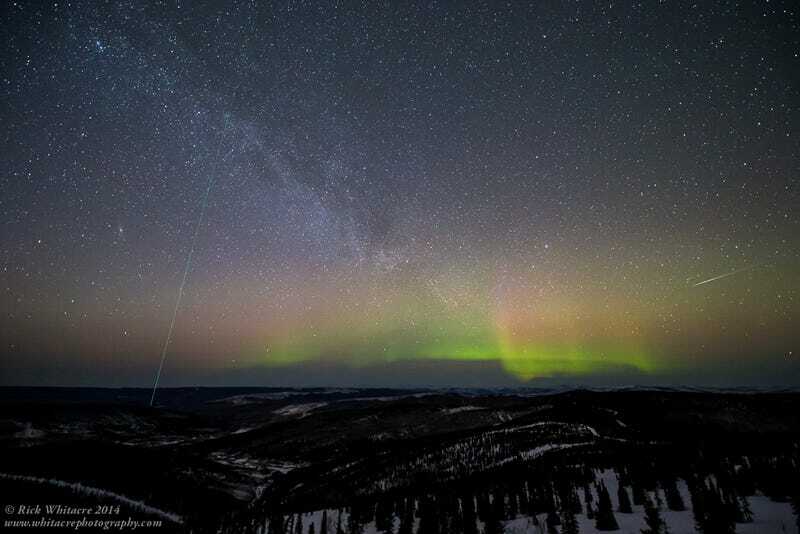 Image Credit: Photograph by Rick Whitacre capturing an aurora, the Milky Way, a meteorite, and a laser all at the same time. That is a lot of beautiful astronomy for one image! Used with permission; thank you, Rick!